The genus name Zingiber and common name ginger derive from the ancient Greek word for the plant, zingiberi, which is itself thought to be of Indo-Aryan origin and possibly to mean "shaped like a horn." Ginger, native to tropical eastern Asia, is a perennial with long green stalks that can grow to 4 feet in height and long, narrow, alternate leaves. The greenish, yellow, or white flowers are streaked with purple and are borne on short, dense spikes. The root is a creeping tuber with several fingerlike protrusions and a pale skin that turns brownish upon drying; it is commonly sold in grocery stores. The plant thrives in partial shade in fertile, moist, well-drained soils. In gardens in temperate climates, the plant will need to be brought indoors when the cold weather begins. Do not confuse ginger with wild ginger (Asarum canadensis), which is unrelated. Ginger has been found to be even more effective than Dramamine in curbing motion sickness, without causing drowsiness. As a digestive aid, it warms the digestive organs, stimulates digestive secretions, increases the amylase concentration in saliva, and facilitates the digestion of starches and fatty foods. It also strengthens the tissues of the heart, activates the immune system, prevents blood platelet aggregation and leukotriene formation, and inhibits prostaglandin production, thus reducing inflammation and pain. Ginger is often included in other herbal formulas, especially those that contain laxative herbs to reduce gripe. The dried root is hotter than the fresh root and is more effective in relieving nausea and warming the body. Fresh ginger is considered best for respiratory problems and dried ginger for digestive ailments. Ginger root is used in the treatment of amenorrhea, angina, ankylosing spondylitis, anxiety, arthritis, asthma, atherosclerosis, bloating, bronchitis, cancer, catarrh, chemotherapy side effects, chills, claudication (intermittent), colds, colic, cough (with white phlegm), cramps, delayed menses, depression, dyspepsia, erectile dysfunction, fatigue, flatulence, flu, food poisoning, gastritis, headache, high cholesterol, hypertension, hypothyroidism, indigestion, irritable bowel, laryngitis, low libido, lumbago, menstrual cramps, migraines, morning sickness, nausea, obesity, pain, poor circulation, post-anesthesia nausea, Raynaud's disease, low sperm count and motility, stomachache, vertigo, wheezing, and worms. It is also used to prevent blood clots, stroke, and heart attack. Topically, ginger can be prepared as a compress and applied over arthritic joints, bunions, sore muscles, and toothaches to relieve pain; over the kidneys to relieve the pain and assist in the passage of stones; over the chest or back to relieve asthma symptoms; or over the temples to relieve headache. Ginger is wonderful in the bath in cases of chills, muscle soreness, sciatica, and poor circulation. It can be used in foot soaks to treat athlete's foot or to relieve the head congestion associated with colds and flu. It also can be brewed as a tea and gargled to relieve a sore throat. Ginger root is a popular spice that adds a pungent, warming quality to dishes. Slices of pickled ginger are often served with sushi, while candied ginger is a popular snack that also calms nausea. The leaves are also sometimes used as a flavoring agent. 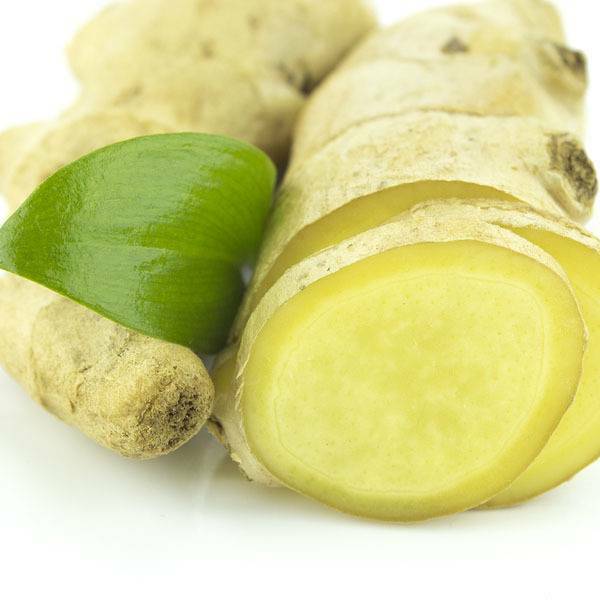 As a tea ginger root is aromatic with a pleasant zesty bite. The flowers can also be made into a tea with a similarly spicy but milder flavor. Although ginger can relieve morning sickness, pregnant women should not ingest more than 1 gram daily. Avoid in cases of peptic ulcers, hyperacidity, or other hot, inflammatory conditions. Avoid excessive amounts of ginger in cases of acne, eczema, or herpes. Ginger may cause adverse reactions when used in combination with anticoagulant drugs such as Coumadin or aspirin; if you are using such medications, seek the advice of a qualified health-care practitioner before commencing use of ginger.